Go back into the backyard and use the stick to dig out the plant on the left. Go back to the new room and look at the left wall. 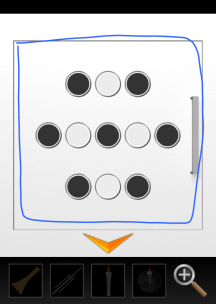 Using the clue piece of paper, tap the orange squares in the correct order. 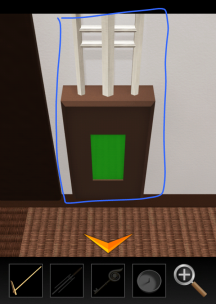 There is a clue on the bottom right ground to open the wall. Take the blow gun and dart. Use them on the ninja in the trees. Walk up to the wooden chest and use the golden token on it. 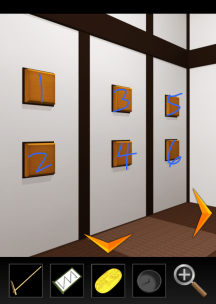 Go back down and use the key on the cupboard below the pictures. 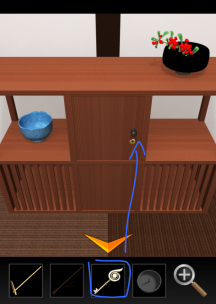 Look at the red button on the wall with the colored spheres. Insert the object in and it'll turn green. Slide the door on the left of the button, to the left and go up the stairs. 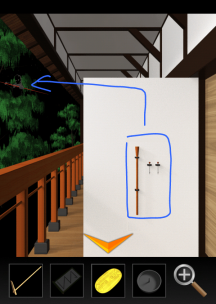 Use the stick to get the item above the wooden beam. 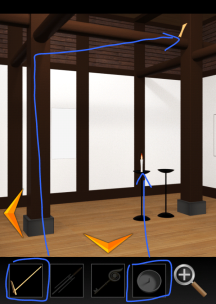 Zoom into the candle base (grey object) and put the candle on it. Look at the white paper on the wall. 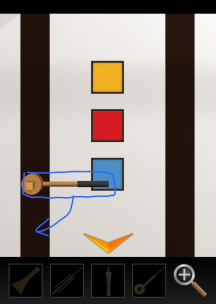 Use the wooden item you got to start removing it, then tap it to remove it. Go back downstairs and into the room with the lantern. 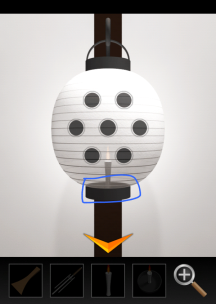 Put the candle and holder back into the lantern and it'll show you a pattern. Go back up the stairs and tap on the far right wall. 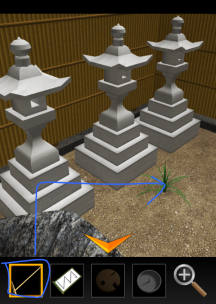 Make the pattern just like on the lantern then open the door and take the tool. 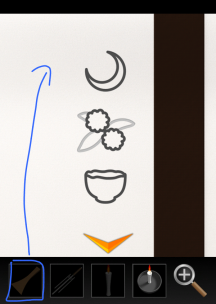 Look at the left side of the room and change the colors of the white squares to match the colors of the objects revealed behind the piece of paper. 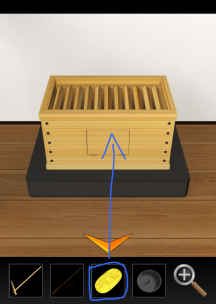 Use the tool on the wooden block, then turn it down to open the door. Use the ladder to escape!